Racism is defined as the belief that the human species is divided into races, which can be ranked as inherently superior or inferior to others, and the actions which result from those beliefs. Racism has existed throughout human history. It has influenced wars, slavery, the formation of nations, and legal codes. Ethnic groups are often linked by linguistic, cultural, ancestral, and national or regional ties. One of the most decisive wars in history was the final Roman war against Carthage, when Carthage was totally demolished, and fleeing soldiers were hunted down right through north Africa. The rest of the inhabitants were taken in slavery.p37 It had nothing at all to do with racism, and everything to do with political and economic rivalry for control of the Mediterranean. World War I had no clear cause, and the reasons for its start are still debated. World War II had both political and economic causes, but since its main adversaries were of the same ethnic group, the cause can hardly be racism. The interesting look backwards by Herman Kahn identifies a failure of deterrence as a main cause. "Slavery was a major institution in antiquity... Prehistoric graves in lower Egypt suggest that a Libyan people of about 8000 BC enslaved a Bushman or Negrito tribe... Slaves built, or helped to build, the... pyramids of Egypt. The first code of laws, that of Hammurabi,... included clear provisions about slavery... Athens had in her heyday about 60,000 slaves". When Portuguese sailors first explored Africa in the 15th and 16th centuries, they came upon empires and cities as advanced as their own, and they thought Africans to be serious rivals. Over time, though, as African civilizations did not match the technological advances of Europe, and the major European powers began to take things from the continent and kidnap people who lived there, forcing them to work as slave laborers in new colonies across the Atlantic, Africans came to be seen as an inferior "species," as "savages." This view was necessary to justify the slave trade at a time when Western culture had begun to promote individual rights and human equality. The willingness of some Africans to sell other Africans to European slave traders also led to claims of savagery, based on the false belief that the "dark people" were all like brothers, and all part of one society - as opposed to many different nations, some of which were at war with one another. In the late 18th century, Europeans began using the term Aryan to refer to the original prehistoric Proto-Indo-Europeans and their descendants up to the present day (i.e., the Indo-European peoples—those Caucasians who are speak the Indo-European languages). It was also assumed at the time, that, Aryans were a naturally culturally superior people. By the late 19th century, some Europeans began to use the name Aryan for only the Nordic peoples of Europe (one branch of the Indo-European peoples), as a "pure," "noble" and racially "superior" race they claimed were descended from the original Aryan tribes. The theory that the Aryans first came from Europe became especially popular in Germany and to a lesser degree in Austria and Hungary. Racism in the U.K., Ireland and France was usually about limiting the rights of Jews, Gypsies and minorities like the French Basques. Alleged scientific findings of racial differences were used by Nazi Germany to justify the racialist policy with its concept of "Großdeutschland" (Greater Germany) and the Nordic racecial idea. The Nazis attitude towards the Jews were Anti-Semitic and falsely blamed them for Germany's defeat in World War I and the Great Depression. The Nazis and some of their anti-Semitic allies, like Hungary, committed genocide against the Jews during the Holocaust of World War II. Both the Nazis and Romania's Iron Guard also persecuted the Gypsies, who were considered part of the allegedly inferior 'Indic' race. During World War II, the Nazis embarked on systematic attempt at genocide of the Romanies/Gypsies, known as the Porajmos. The Nazis also knowingly killed of thousands of Slavs, s, Communists, liberals and s.
Italy, like Germany, Austria and Hungary mistakenly regarded all Slavs and Gypsies as stupid, racially inferior due to the effects of Social Darwinism and undeserving of their basic rights. Anti-Arab discrimination was also used in parts of Libya. The Iron Guard was an antisemitic fascist movement and political party in Romania from 1927 to 1941. They despised and denounced both Jews and Gypsies. The United States' legal system has been accused of racism. 40% of the prison population are black. 12% of the general population is black. Black people are more likely than white people to be sentenced to death for a crime. The New York Police Department stop-and-frisk program has been accused of racial profiling. In the United Kingdom the two most popular nationalist political parties are the British National Party (BNP) and the UK Independence Party (UKIP). There is also a group called the English Defense League (EDL). They are all thought to be racist by a lot of people. They are against immigration and Islam. Although Muslims can be of any race, they are usually South Asian. It is believed[who?] that a lot of white British people do not like Muslims because of racism. In a 2013 poll, 27% of 1000 British people aged between 18 and 24 said that they did not trust Muslims. In the United Kingdom most people are white. 7% are Asian and 3% are black. 4.83% of the British population are Muslims. South African Apartheid laws were a system was used to deny many rights of non-white people. They started in 1948. The laws allowed the white minority to keep the Black majority out of certain areas. Black people had to carry special papers (passes) or have permission to live and work in particular areas. Whites opposed intermarriage with non-whites and coloured people were also discriminated against, but not as badly as the non-whites. 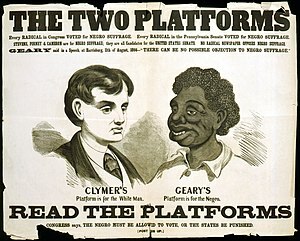 The blacks suffered greatly and were even banned from voting at one point. Nelson Mandela became South Africa's first black president in 1994. Mandela ended apartheid. With the revelations of the holocaust old ideas about race changed and, more slowly, the prejudices about race faded. The civil rights movement tried to liberate persons of African origin from racist white supremacist rule in South Africa and the southern USA. Blacks could vote in South Africa after a 50 year ban. In some cases positive discrimination, the ethnics 1st laws and political correctness have taken the situation to the opposite extreme, leading to accusations in the UK, USA and Australia of reverse racism, that is to say racism in favor, not against the ethnic minorities. 'Political correctness' is a term applied to language, ideas, policies, or behavior seen as seeking to minimize offense to gender, racial, cultural, disabled, aged or other identity groups. Conversely, the term "politically incorrect" is used to refer to language or ideas that may cause offense or that are unconstrained by orthodoxy or good manners (e.g. racists and Islamophobes). The Ku Klux Klan is a movement that has racist ideas. ↑ Risch N. et al (2002). "Categorization of humans in biomedical research: genes, race and disease". Genome Biology 3 (7). doi:10.1186/gb-2002-3-7-comment2007 . PMID 12184798 . ↑ Hua Liu et al (2006). "A geographically explicit genetic model of worldwide human-settlement history" (Scholar search). The American Journal of Human Genetics 79: 230–237. doi:10.1086/505436 . http://www.journals.uchicago.edu/AJHG/journal/issues/v79n2/43550/43550.html. ↑ Jorde L. et al (2000). "The distribution of human genetic diversity: a comparison of mitochondrial, autosomal, and Y-chromosome data". Am J Hum Genet 66 (3): 979–88. doi:10.1086/302825 . PMC 1288178 . PMID 10712212 . ↑ "The use of racial, ethnic, and ancestral categories in human genetics research". Am. J. Hum. Genet. 77 (4): 519–32. 2005. doi:10.1086/491747 . PMC 1275602 . PMID 16175499 . ↑ Bamshad M. et al (2004). "Deconstructing the relationship between genetics and race". Nat. Rev. Genet. 5 (8): 598–609. doi:10.1038/nrg1401 . PMID 15266342 . ↑ Tishkoff S.A. & Kidd K.K (2004). "Implications of biogeography of human populations for 'race' and medicine". Nat. Genet. 36 (11 Suppl): S21–7. doi:10.1038/ng1438 . PMID 15507999 . ↑ Jorde L.B. & Wooding S.P. (2004). "Genetic variation, classification and 'race'". Nat. Genet. 36 (11 Suppl): S28–33. doi:10.1038/ng1435 . PMID 15508000 . ↑ Kahn, Herman 1961. On thermonuclear war. 2nd ed, Princeton University Press, Chapter VIII The real past, p350 et seq. ↑ 22.0 22.1 Tsuzuki, Chushichi. The Pursuit of Power in Japan 1825-1995. Oxford University Press, 2000. P. 244. ↑ 23.0 23.1 Nish, Ian. Japanese Foreign Policy. Routledge, 2001. P. 234. This page was last changed on 17 December 2014, at 20:57.